Nebraska Newspapers « The Plattsmouth daily herald. (Plattsmouth, Nebraska) 1883-19?? About The Plattsmouth daily herald. The Plattsmouth daily herald. : (Plattsmouth, Nebraska) 1883-19?? Description based on: Volume 1, number  (March 9, 1883); title from masthead. Other editions. 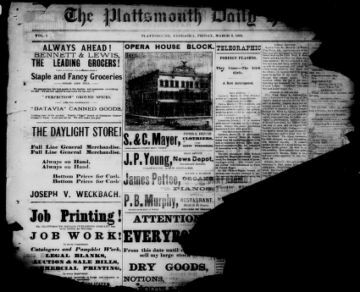 : Plattsmouth weekly herald, 1882-1892, and: Plattsmouth herald, 1892-1894. Suspended after <January> 1885; resumed with 1st year, no. 1 (September 12, 1887).